Preview your upcoming year as a chapter president or administrator by reviewing the important “mile markers” along the way. 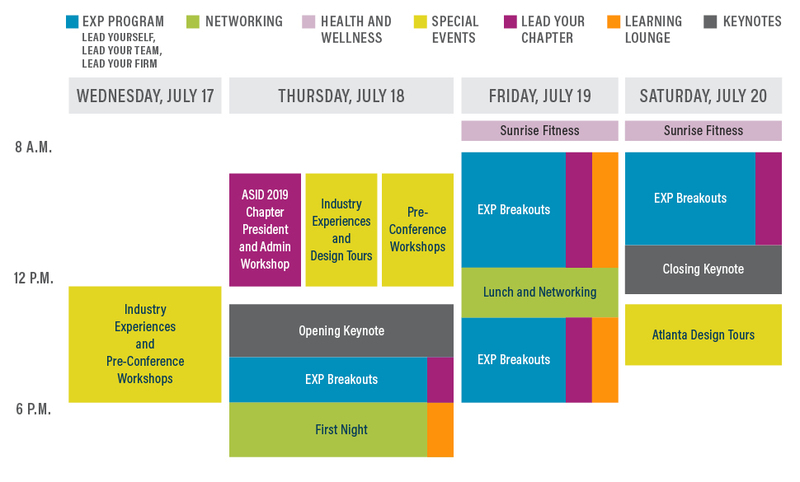 You’ll learn about the key attributes of ASID volunteer leaders, how to build a cohesive board team, and start thinking about how you will leave your board in a stronger position at the end of your term. You’ll also meet your Chapter Support Team leaders for a deep dive into EXP and how to effectively lead your chapter to get the most from your experience. Celebrate your successes from the current year and get inspired to kick off your new term at EXP. Learn the importance of listening to facilitate effective team productivity and collaboration. Communication is critical to any relationship and the most fundamental of all the soft skills. It is the most important of the six key indicators of highly functioning teams. You’ll connect and bond with your fellow board members. Hear the story of ASID from CEO Randy Fiser, Hon. FASID, to understand who we are historically, today, and tomorrow. Explore what our brand represents, and the value we bring to the interior design profession and greater society. Learn more about your fiduciary responsibilities as a chapter board member and the checks and balances in place to ensure good governance and smooth operations. You’ll also explore strategies to lay the groundwork for strong board succession planning and onboarding. Gain an understanding of your role in selling the ASID value proposition by learning strategies to effectively weave together your communications, programs, membership recruitment and retention, and student engagement to strengthen and sustain your chapter. Positions: Not assigned; Will provide guidance on whom you should meet with depending on your role. Get your questions answered by the experts on topics such as ASID communications, membership, finance, programming, CEUs, sponsorship, government/public affairs, and the ASID Foundation. Learn how we can help you do your job better in our roundtable-format discussions with staff and volunteer leaders. Cap off the Lead Your Chapter experience with a preview of the year ahead and the key milestones on your path to a successful term. Learn more about national initiatives and programs that add value to membership, and how you can effectively align the chapter and national experience. You’ll end the hour energized and ready for October 1.